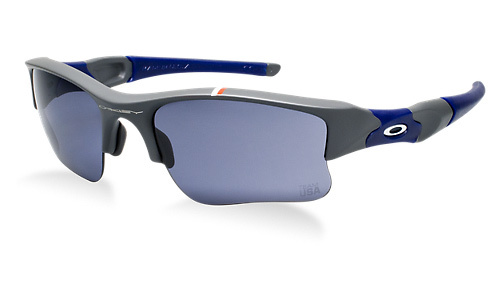 Made of lightweight O Matter for all-day comfort, this dark grey frame lets you change lenses in seconds to optimize vision in any sport environment. Oakley's liquid infusion process eliminates the haze and distortion found with ordinary polarized lenses, while the semi-rimless design means there?s no frame rim to block downward view. This special edition Team USA style features white icons on blue stem segments. The Unobtainium earsocks are also blue. A white and red band of color has been added to the top edge of the frame for patriotic pride. The XLJ lens size provides extra coverage and is a performance favorite among athletes for its neutral transmission which maintains color perception.